On the waterfront in Rock you will find Camel Ski School. They provide a variety of water sports for groups or individuals. We work with our clients to create leaflets and brochures to showcase all the products they offer. For 2018 we went for a modern neon design that is as vibrant as it is full! 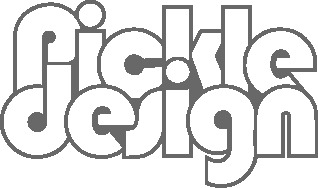 We matched the design to their website helping everything tie in. With bold titles and watercolour and shimmery textures we broke up the different activities. 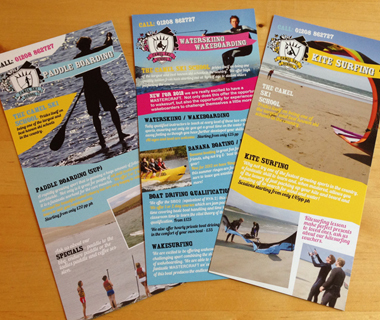 For 2016’s tourist season we designed a six page DL flyer distributed throughout North Cornwall in leaflet stands. This year we also designed their brochure. This project came with a challenge – some needed to be branded for Camel Ski School and for the St. Moritz hotel. For this we came up with a wrap or dust jacket that would represent both in fresh and vibrant cyan. Full of action, colour coded and with spacious text. We wanted to convey the fun of messing about on the water as well as the professionalism of the instructors. We used uncoated paper but the colours still look rich and the handy size makes the brochure very pick-up-able. In 2015 we designed them this A4 folded to DL leaflet to entice locals and holiday makers alike. Bold, eye-catching and full of fun action shots. We also designed a poster and some flyers to encourage local kids to join in their Ski Club. The Ski School wanted large signs to catch attention on the beach-front at Polzeath and at Rock. We used large photographs in a montage style to communicate what they do, matching in the brand style. Camel Ski School also run Camel Camps for schools. In 2012 we created this eight page A6 concertina fold leaflet, printed on 300gsm uncoated stock. 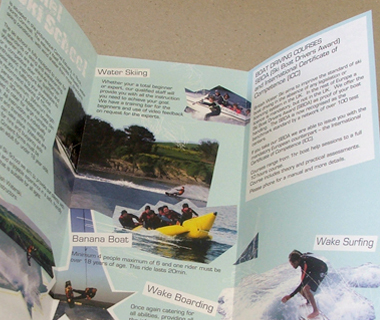 An eye catching brochure for the younger watersport lover. In the same year to reflect the varied nature of the services provided by Camel Ski School, we designed 3 leaflets separating out the key activities into DL flyers. These were printed on 300gsm stock. Back in 2007, this A4 folded leaflet was designed with the intention of creating something that leapt off the page. We then applied the visual style to their compliment slip which also needed to highlight the services they provided.